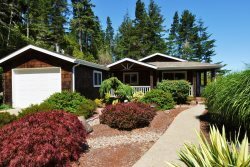 Contact Us | Florence Oregon Vacation Rentals, Inc.
Florence Oregon Vacation Rentals is a family-owned business located on the beautiful Oregon Coast in Florence, Oregon! Barry and Shannon Nivilinszky are the proud owners of Florence Oregon Vacation Rentals, as well as its partner company, Coastal Property Management, Inc. Barry says, "We are committed to offering the best selection of vacation homes in the Florence area, and if you're looking for a place to enjoy a family vacation or just a quiet getaway, you’ll find it here with Florence Oregon Vacation Rentals." Shannon states, "We believe in giving the best personal service to each one of our customers so that you'll have an unforgettable experience that will bring you back again and again!" The staff at Florence Oregon Vacation Rentals are ready to assist you should you have questions regarding your future stay on the Oregon Coast. Simply email us at [email protected] or phone 541-997-1351 during normal business hours and one of our friendly reservationists will be happy to take your call! Contact Coastal Property Management, Inc.